Aesthetic refinement and horological complications engage in a subtle dialogue on this watch in pink gold PVD-coated stainless steel that gives pride of place to the graceful charm of mother-of-pearl. 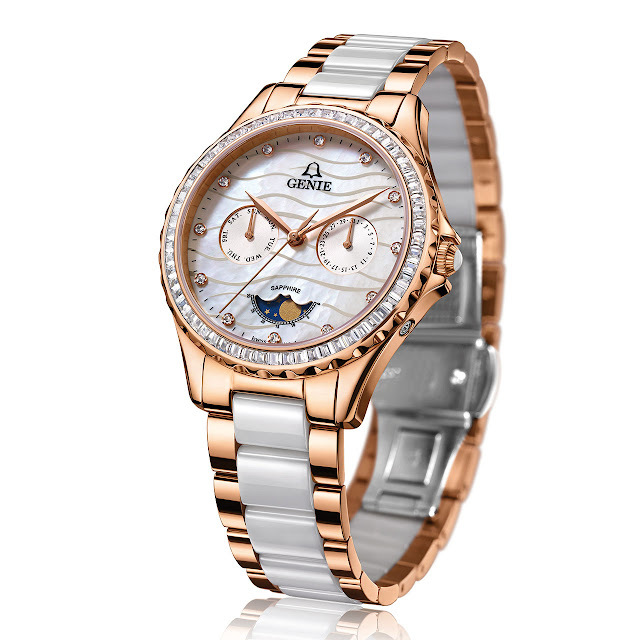 The romantic touch of an elegant moon phase is complemented by the useful day and date indications. The shimmering iridescence of the white mother-of-pearl dial is softened by a wave motif that glows in the light of the hour-markers set with Swarovski crystals. The pink gold PVD-coated stainless steel bezel is also adorned with a halo of 60 Swarovski crystals. The dainty elegance of this timepiece extends onto the bracelet featuring a pleasing contrast between the warm shades of pink gold PVD-treated stainless steel and the sporting touch of white ceramic. The feminine wrist is thus gently caressed on any occasion, whether in daily use of for sparkling evening wear. Hours, minutes, seconds, day, date, moon phase. 316L steel with pink gold PVD coating, 37mm. Bezel in 316L steel with pink gold PVD coating, set with 60 Swarovski crystals. Sapphire crystal. Water-resistant to 50m (5 bar/165 ft). White mother-of-pearl dial with wave motifs. Hour-markers set with 12 Swarovski crystals. Date at 3 o’clock , moon phase at 6 o’clock , day at 9 o’clock. Pink gold PVD-coated stainless steel and white ceramic links. Folding clasp.